The Supreme Court Committee on Judicial Ethics Opinions (CJEO) issued oral advice that a judge may administer the oath of office to a newly elected district attorney. 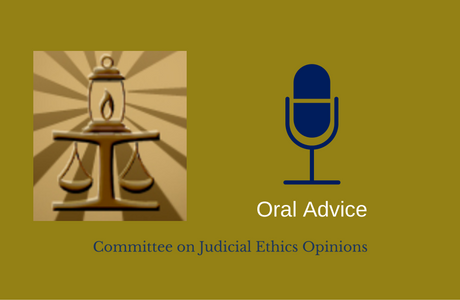 CJEO Oral Advice Summary 2016-018 concludes that because judges are authorized by law to administer the oath of office that all public office holders are required to take under the California Constitution, doing so is an official function of judicial office. The committee concludes that performing an official function does not create an appearance of bias because a person aware of the facts would not entertain doubt as to the judge’s impartiality. Thus, the committee advises that an appellate justice may administer the oath of office at a ceremony to swear in a public official, including a newly elected district attorney who may appear in the judge’s court, without creating an appearance of bias in violation of the Code of Judicial Ethics. We're pleased to be able to assist judges in knowing that performing an official function at this type of civic ceremony is permissible under the Code of Judicial Ethics.